Watch: Arab rioters pelt tourists, police with stones and other objects on Temple Mount during Ramadan. 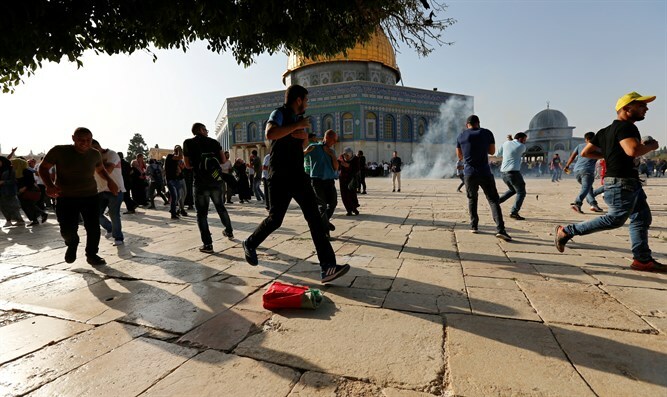 At least two people were injured after riots broke out on the Temple Mount Thursday morning. Masked Arab rioters hurled rocks, chairs, and other objects at a group of tourists who were visiting the Temple Mount in Jerusalem, injuring one of the tourists. The injured man was evacuated from the holy site for treatment, and is listed in light condition. An Israeli police officer who was nearby at the time of the assault attempted to intervene, but was also hit by stones, and suffered light injuries. Police reinforcements were deployed to the Temple Mount, and two of the rioters were arrested. According to a police spokesperson, authorities have opened an investigation into the incident, and are searching for other rioters involved in the attacks. The Palestinian Authority mouthpiece WAFA claimed that Israeli police officers used stun grenades near the Al Aqsa Mosque to break up the riots. The incident comes as the Muslim holy month of Ramadan enters its final week ahead of the Eid al-Fitr festival which begins next Thursday night. Mass riots are expected along the Israel-Gaza border this Friday, part of the delayed observance of “Naksa Day” (Day of Setback), marking the 51st anniversary of the Six Day War. Smaller disturbances are expected in eastern Jerusalem and Judea and Samaria.